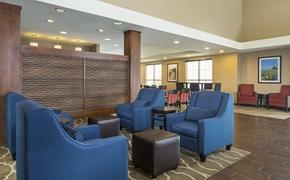 Are you tired of booking a hotel to get the same average experience? Well, leave those mundane experiences behind and join the bandwagon of themed hotels that are well-designed to add a little adventure to your travels; even if it means catapulting through the air, taking flight or sleeping in an automobile with the top down. The following five hotels alter the state of mind by converting their properties into premier playgrounds for their guests. So before you think about booking another conventional hotel stay, why not incorporate a quirky theme to make your escape stand out? You don’t have to leave this hotel to go sightseeing because the V8 Hotel is a marvel in itself. The property takes car lovers on a wild ride with a distinctive style powered by the automobile. 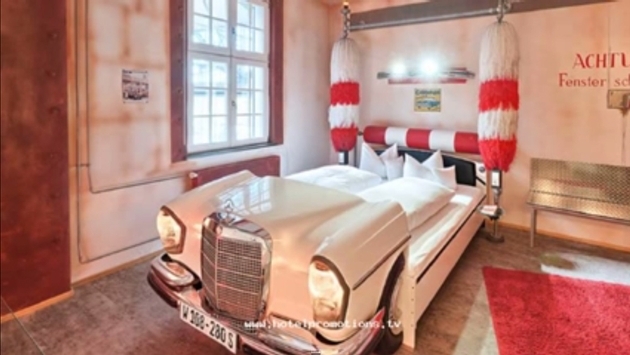 However, guests just won’t find classic automobiles knocking around because roaming through each room is like cruising in style with architecturally decked-out suites complete with car beds, paintings and amenities to bring out their inner motor-heads. And if visitors are looking for the ultimate speed thrill, the Tower Suite has it all, including three floors equipped with lavish services like a sauna, underground parking and a vintage Benz fluffed with large pillows and cozy white linens. From the moment one arrives at the Circus Circus Reno Hotel and Casino, it doesn’t take long to notice it was intended to be more than a conventional hotel destination. That is because the hotel brings the excitement of the strip indoors while incorporating a family-friendly twist with carnival games and circus acts. Still, some may say they pale in comparison to The Adventuredome, the United States’ largest indoor theme park. Inside, visitors can perform acrobatic techniques of their own like flying through the air from The Sling Shot and spinning in dizzying circles while riding the Disk’o. London’s Aviator Hotel takes the mile high club to a whole new level with is a trendy aviation theme. In fact, guests are made to feel as though they are soaring amid the clouds in first-class by the manner in which its premises embody the aircraft experience with more leg room than any traveler can imagine. It has three variations of contemporary designed suites which are: Aviator Rooms, Aviator Studios, and Sky Suites that are accentuated with plush beds, lounge chairs, spacious bathrooms and cutting-edge sound systems. And when guests are looking for a cocktail to complement its luxurious aviation experience, the Sky Bar is the place to be, with views of a privately owned airport. Travelers typically don’t look for a hotel that is reminiscent of being locked in prison, but walking through the Liberty Hotel’s prison cells and staring at its brick walls are not meant to make guests feel ashamed for their wrongdoings. Instead, these cells are preserved to heighten and demonstrate how the hotel has come a long way from its restricted past. Despite the fact that the hotel was once Charles Street Jail that famously imprisoned Malcolm X, Nicola Sacco and Bartolomeo Vanzetti, guests can awake anew without a guilt-ridden thought plaguing their minds. In fact, they will be intrigued by the imprints left by its jailbirds while freely enjoying all of its unique flair and amenities including the courtyard which was once the area where the jailors exercised. If this hotel looks familiar to you then you might just be an obsessed with “Star Wars.” Hotel Sidi Driss first hit the big screen when this historic Berber house was transformed into the Lars family’s alien abode on the planet of Tatooine in A New Hope to be later redesigned for Attack on the Clones. Now that the dust has settled and Luke Skywalker no longer resides here, fans from far and wide visit the site, dubbed the Star Wars Hotel to witness the phenomenon up close. Although reserving a room in its array of pits is unlikely, visitors can eat like the galaxy depends on it from the restaurant. READ ON: Ever wanted to stay in the Batcave? Want to check in like James Bond? Check out 5 more hotels with real "character."